The premier film of my childhood: Spice World. If you haven’t seen or re-watched this film recently, do it right now seriously go. Even if you aren’t a Spice Girls fan. In fact, especially if you aren’t a Spice Girls fan, because there’s something in this film for just about everyone. The premise: Real-world superstar 90s girl pop group the Spice Girls embark on a national tour, followed by a film crew. Meanwhile, an evil tabloid manager has hired an evil paparazzo to try to discover (or manufacture) the girls’ dirty secrets, to ruin their careers. That’s ostensibly the plot of this film, but I say “plot” in only the loosest sense of the word, because the ongoing “story” gets completely lost about 90% of the time. Instead, the girls just kind of sprint from wacky scenario to wacky scenario, playing up exaggerated versions of their pop personalities and relationships (which have no bearing on reality), and shouting a lot. Another element that sets this film apart is the dialogue. Each of the girls has her own over-the-top personality to contend with, but as a whole their personality is characterized by bad puns and a deeply meta sense of humor about themselves. It’s like a bunch of writers just got together drunk in a windowless room and brainstormed stupid one-liner gag jokes for two and a half hours, and then they made a movie out of it. And that’s before you take into account the deliberate nonsense that comes out of the “studio manager’s” mouth. And did I mention the 90s music? I mean, come on, guys. This is the Spice Girls. Also Meat Loaf is in it, and yes, he says the thing. Bonus: Finish your glass, dance, and sing every time they get to a musical number. Where it’s available: Tragically, Spice World is not available anywhere that I could find streaming online. It was, however, re-released on DVD, and you can buy it from Amazon. Or, you know, rent it from the video store. Those are still a thing. P.S. 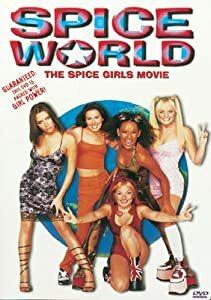 If you don’t want to wait until you can find a rental (or download–shhh) of the film, I would also highly recommending watching the Spice Girls’ various music videos, all of which are available in their entirety on youtube. They are…interesting. Viva Forever is my personal favorite.